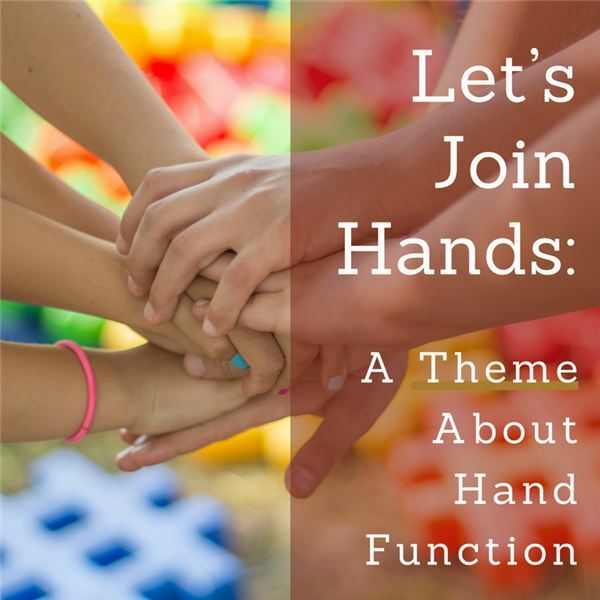 Begin this unit on hand function by having your students take a closer look at their own hands. Did you know that our hands are made up of 27 bones and they account for one-quarter of all the bones in the body? See if you can obtain some x-rays from an orthopedic surgeon so the kids can view all 27 bones. Count them! Ask the kids to make a fist to emphasize their knuckle bones, then bend and straighten the fingers to see their hinge joints work. Next, move the thumbs in and out to observe how well the saddle joint works. It allows the thumb to bend and rotate. People shake hands – it’s a gesture of welcome and friendship. Soldiers in the military welcome each other with a hand salute. And, if you are into Star Trek, you may know the Vulcans (like Mr. Spock) have their very own unique handshake, which requires you to separate the fingers between the middle and ring fingers. Why not make up your own silly handshakes and practice these during circle time? Challenge your students with this thinking activity. Brainstorm a list of things you can do with your hands. Then make a list of things you can do without your hands. Which list is longer? Encourage your kids to make a handy booklet. Trace around the child’s hand and cut this out. Tell the children to use their template to draw several more hands (six or more) on sheets of paper and cut these out. Have the kids draw pictures on each page showing actions they can do with their hands. The list from the previous activity may help with ideas. Assemble the booklet pages together, punch two holes at the wrist area, and thread yarn, ribbon, or raffia to bind the pages together. Clap your hands together; slap your partner’s hands. Clap your hands together; slap your partner’s right hand with your right hand. Clap your hands together; slap your partner’s left hand with your left hand. All clapping rhymes employ a sequence of these motions while chanting a rhyme. Let the children explore with such variations as snapping fingers, slapping the thighs, slapping a partner’s hands, etc. To see the elephant, elephant, elephant. ‘Till the end of July, ‘ly, ‘ly. “Before the hunter shoots my hide!" The thumb is our most important digit. It is opposable, meaning the thumb can rotate around to touch the palm of your hand and the fingertips. This bending and rotating ability of the thumb is what gives us our manual dexterity. Our thumbs have been the inspiration for many artistic endeavors. Share classic books like the tales of Tom Thumb and Thumbelina with the class. Artist Ed Emberley has shown how to create artwork out of thumbprints. Why not engage the kids in thumbprint art? Have them dip their thumbs into paint (or a stamping pad) and make a print on paper. Encourage your students to draw faces, arms, legs, tails, wings, etc. to create their own thumbprint creatures. We are all born with a tendency to be right-handed or left-handed. Take a poll to see who uses their right hand or left hand. Can you use both? Experiment with handedness. Ask the kids to scratch their back. Which hand did they use? When you cross your arms, which arm is on top. Obviously, when you pick up a pencil to write you are using your dominant hand. What happens if you use the opposite hand? Does it feel awkward? Try using the opposite hand with some activities just for fun. Explain to the children the saying, “lend a hand." Talk about all the ways hands can be helpful to people. Make a list of ‘helping hands’ actions on paper and give this paper to each child in your class. Invite students to dip their hand into tempera paint and make a print on the paper. These are just a few of the many activities that can be performed with hands. Think about how blind people use hands (fingers) to read, how hands are used to conduct sign language as communication for the deaf, and the fun of using hands to engage in shadow play. Hand function is not only useful, but fun too!